The Revell Pz. IV Ausf. H represents a mid-series version of the Ausf. H (there were a great many changes to this tank during its production run). This new set from Coelian Models does two things: it converts the kit into an earlier version of the tank, and it also adds zimmerit coating. 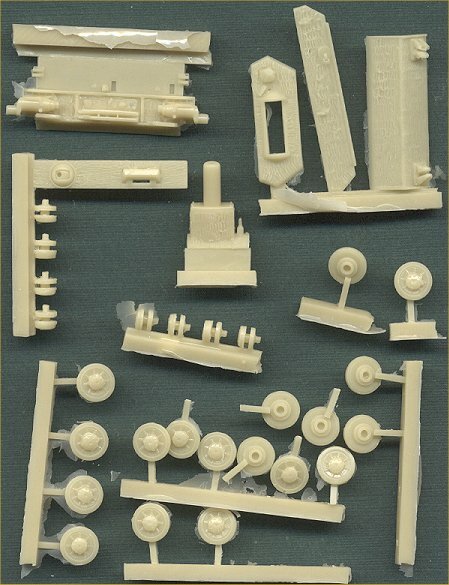 The wheels in this kit have been altered to represent the earlier style with the cast hub, instead of the stamped hub included in the Revell kit. Likewise the return rollers have been converted to rubber-tired wheels instead of the all steel wheels in the plastic kit. The zimmerit covers only certain portions of the kit, as it was often applied to only the front and rear-facing portions of the tank, the sides being covered by the stand-off armor plates. As always, I am very impressed with the zimmerit coating, being very delicate and nicely molded.